Packing humor that’ll sail right over the heads of very young children and sticking to a plot that’ll bore most grownups, Goosebumps 2: Haunted Halloween finds a safe space with young adults because it’ been strictly made for a middle-school crowd. This is for the kids who fear bullies (or are them) and whose imaginations run wild (or not enough). It’s a school library’s Scholastic Book Fair, much to the joy of the kids and the dread of the parents who don’t even want to be there. 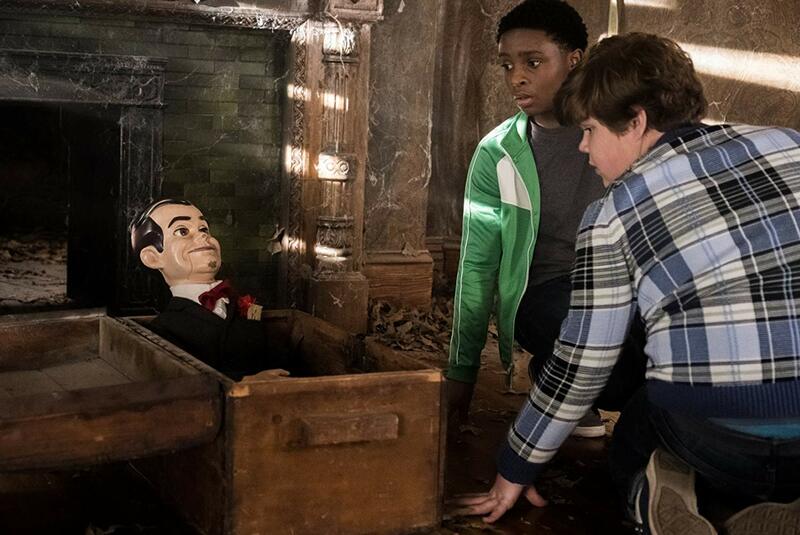 Goosebumps 2 doesn’t have something for everyone, but it sells itself well enough to the niche crowd it’s been marketed towards, and the entire entity is like if a Halloween City store had magically come to life. Located in the small town of Wardenclyffe, famous for Nikola Tesla’s humongous transmission tower, a couple of kids stir up a frenzy. Sonny (Jeremy Ray Taylor) wants to perfect his small model of the tower for a science project, the Sister Sarah (Madison Iseman) is stuck babysitting him while Mom (Wendi McLendon-Covey) covers multiple shifts at the nursing home, and Sonny’s best friend Sam (Caleel Harris) drags him into a junkyard scrapping business plan. For such a light-hearted, largely empty-headed film, the story is especially heavy on plot during the opening act, although it does take a positive turn when the young boys find the ventriloquist doll Slappy (voiced by Mick Wingert) and an unfinished manuscript in an abandoned house. Working off of an R.L. Stine original with no written ending, Slappy tries to force his way into the family through ingratiating acts of kindness, like a genie with endless wishes but a deranged agenda. Slappy wants to be part of a family and sees this as his opportunity. He’s shunned, quite rightfully so, and the little puppet uses his powers to bring all of Halloween to life, wrecking havoc across this little town unless the kids can save the day. 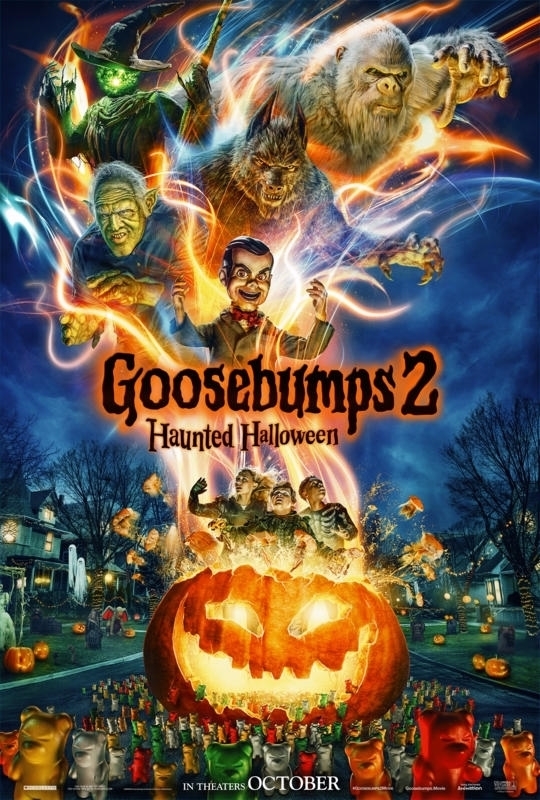 Goosebumps 2 has a very routine, expected trajectory that basically catches every pitch it throws, and nothing feels new or improved upon from the first go around. And yet, while the movie is decidedly extremely mediocre, the scaled back budget at least allows it to walk the way it talks, ending up in a film that elevates itself through the Stine name-brand despite the execution of a made for TV picture. It’s a cheesy, funky, slightly off monster mash of a movie. Goosebumps 2 is only better than its predecessor because it allows itself to be grounded in its own immaturity. While it lacks the energy of Jack Black as author R.L. Stine (he’s in maybe ten minutes of the film, and even at the end, seems to have asked to be written out of the series altogether), the movie still zips along at a fast clip. I for one prefer this low-budget approach, mostly since it feels more in-tune with the era that the picture prescribes to. Both Goosebumps movies have serious Hocus Pocus / Small Soldiers vibes to them, yet the 2015 feature had a terrible final plot twist drenched in male wish-fulfillment and a bevy of bad CGI. Goosebumps 2 does less because it shouldn’t do more, and while it has no tricks or treats, it’s the kind of absurdly routine movie that 90’s kids would’ve ripped off of Blockbuster shelves. Goosebumps 2: Haunted Halloween is a modern, updated, and more technically advanced take on the disastrously delightful 1994 film Munchie Strikes Back, except that it’s just a tad less dumb. Only a little, though.